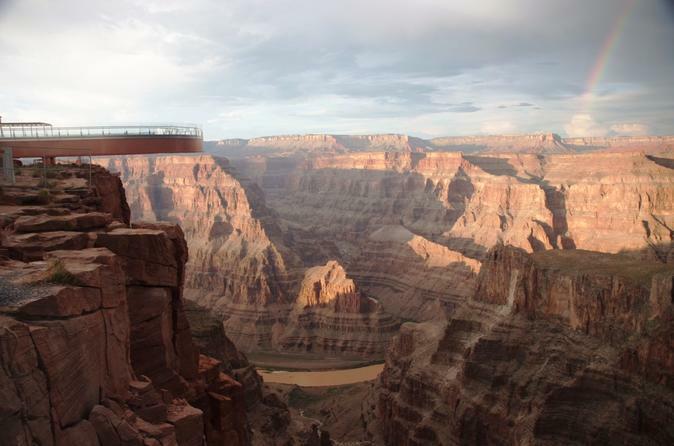 See the Grand Canyon West Rim at your own pace when you hire a SUV for a self-drive day trip from Las Vegas. You will be supplied with a map, driving directions and a full tank of gas. Throw away the timetables and forget about other people's schedules as you explore the Grand Canyon your way. Please note, a minimum of 2 people per booking is required. You will be picked up by complimentary shuttle and taken for assignment of your automatic SUV for the day. All passengers will receive a map and entry into the Grand Canyon. When you hit the road you will pass Boulder City and Lake Mead to Hoover Dam. Drive through a 900-year-old Joshua Tree Forest before turning onto the road to the Grand Canyon West Rim and the lands of the Hualapai Tribe. You are free to explore Guano Point and Eagle Point at your leisure - no timetables, no schedules - its all up to you. Helicopter/Boat - Take a helicopter ride to the bottom of the canyon, then enjoy a 15-minute pontoon boat ride on the Colorado River!